The Club - Founded in 1988. A jogging club to start with but over the years we have progressed to a full road running and cross country club. We have a membership of around 90 people split evenly between Men and Ladies between the ages of 16 and 65 years. 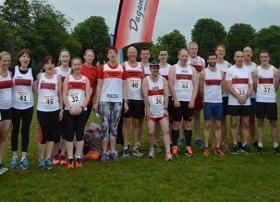 We have a thriving Senior and Veteran section who compete in various Road Races and both the Essex Cross Country League and South Essex Cross Country League. However, many members still prefer Endurance Races and other challenging style events. There is also a well established Walking Section and the regular 'off road cycle' rides in the summer should you prefer something different. All standards are always welcome - It doesn't matter whether you're fast, slow, large or small, we'll look after you.